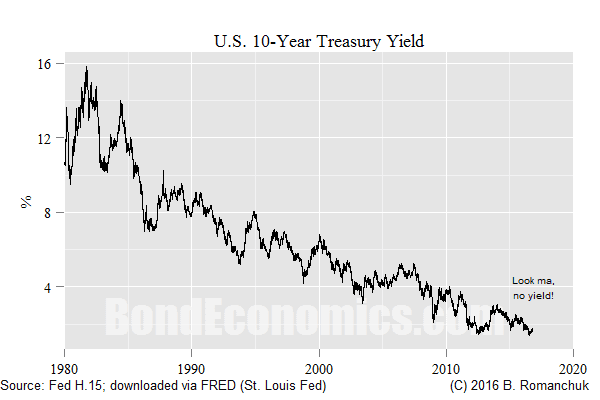 Bond Economics: Will Treasury Yields Ever Escape The Low Yield Trap? Will Treasury Yields Ever Escape The Low Yield Trap? I was at a dinner last week that was associated with a financial industry conference in Montréal. The investors were generally not focused on fixed income, but I was asked the following question - is there anything which will drive developed country yields up? Furthermore, I have seen a number of recent articles declaring how rising bond yields will lead to some sort of crisis, so I just want to refresh comments that I have made on this topic over the past few years. For this article, I will just write about U.S. Treasury yields, as most other developed markets are in a similar position, although with some thematic differences (for example, Japan). The exception (as always) is the euro area. By re-introducing sovereign risk, the brain trust in the euro area managed to demote their government bonds to emerging market status. As always, emerging markets are a roller coaster ride when compared to the sedate govvie markets that I focus on. Cyclical Bear Market Possible - So What? It is entirely possible that there will be a Treasury bear market that could drive the 10-year yield up to 3%, or gosh, even 4%! (Please look at the y-scale on the chart above to get a handle on the context of such a yield change.) Such a move will probably cause at least some funds to blow up, and cause excitable talking heads in the media to scream about the end of the world. As I discuss below, such a bear market is a nothingburger - so long as you are not invested in (or work for) one of the funds that blows up. Even if such a yield rise occurs, the New Keynesians at various central banks will slice the policy rate back to 0% at the next downturn, so we would still be stuck in the same secular low yield environment. What I am interested in for this article is whether the 10-year yield could hit 5-6%. For believers in the natural rate of interest, the complete lack of economic acceleration implies that the actual policy rate is near the natural rate. (I discuss this further in Interest Rate Cycles.) Therefore, there is no reason to believe that the current level of interest rates is "unsustainable." Central bankers generally have to at least say that they believe that a natural rate of interest exists. Therefore, in the absence of a change of personnel at the central bank, the only way of greatly dislodging the policy rate above 3% is for the economy to accelerate. What Is The Source of Acceleration? There is not a whole lot of reasons to expect economic growth to accelerate on its own. We either need a change in "private sector" behaviour (which also includes the foreign sector, and trade policy decisions by foreign governments), or else there could be a policy-induced shift. The most likely candidate for a change in the private sector would be for the development of a labour-intensive sector that starts growing. Although this could happen as the result of a new technology, technologists currently have a singular focus on eliminating labour requirements. Although I see such shifts as possible, I do not have any strong candidates (but that may just reflect my lack of imagination). However, in the long run, rising labour intensity is almost certain, but possibly not for good reasons (for example, rising energy costs could make capital substitution for labour non-economic). A policy-induced shift in nominal growth is always possible, but I am not holding my breath. For example, massive labour-intensive projects could be ramped up. The current governing elite is doing quite well with the current policy mix, and so I see little reason to expect voluntary policy mix changes. Populist politicians are picking up on the discontent of the non-elite, and so perhaps a changing of the guard could lead to more rapid governmental job creation. In other words, higher nominal GDP growth would finally push conventional central bankers to raise rates. It will presumably happen sometime, but as JGB bears have discovered, "sometime" can be decades after you are stopped out of your short govvie positions. One alleged wild card is the tendency for markets under pressure to turn price corrections into routs, as trend followers pile in, and weak hands get stopped out. One periodically hears that governmental bonds are in a bubble that is going to collapse and crush everybody. The reality is that government bonds are hated by the investment committees for institutional investors. On the retail side, I have never talked to a retail investor who was excited to buy government bonds, and I have been billing myself as a fixed income analyst of some sort since 1998. I got questions about assets like internet stocks, condos, high yield, and energy stocks all of the time. Developed government bonds? Crickets. The only weak hands on the horizon are the "risk parity" shops, and the relative value fixed income funds who always end up with too much leverage at the top of a cycle. Sure, such funds blowing up might cause a certain amount of entertainment, but the reality is that their balance sheets are tiny relative to the real money investors. The wiping out of those weak hands is probably part of the mechanism behind a cyclical bond bear market. Pretty much every major pension plan has assets that are shorter than their actuarial liabilities. There is some level of interest rates that causes them to step in and stabilise the market. They would certainly be very happy if that level was 6%, but if everyone is fantasising about the markets delivering the same thing, we tend not to have that outcome. The market alone cannot move the long end too far; yield rises have to ratified by a hawkish central bank. In the present environment, the level of the currency may be the only transition mechanism from the policy rate to the real economy that is functional. The theory being that if the Fed hikes rates, the U.S. dollar would soar versus its trading partners (that have even more sluggish growth). This would damage trade competitiveness, and act to slow growth. This might take further rate hikes off of the table. Although I have some doubts about that story, it is clear that a lot of central bankers roughly believe in this effect. As a result, we are unlikely to see a single developed country central bank to go off on its own with rate hikes, if every other major central bank is keeping their policy rate near zero. The implication is that changing conditions in one country might not be enough to move the global high quality interest rate complex. Although a cyclical bond bear market could always hit, getting the nominal bond yield to 5% or above is probably going to require some structural economic changes to the major developed economies. Personally, I think there is a little too much bravado in you blog. May be you are short bonds, well, at least not long? Anyway, a 0% to 6% move surely would blow the roof off? The question who is holding bonds? Is this one of the asset classes that the Fed has been buying as part of its QE programme? Someone has to get burned if the markets bust. To start with my personal positions, I am a recovering secular bond bull. I have a boring passive portfolio, with a bond allocation. If there is a sell off, c'est la vie. It would create interest in bonds once again, which would presumably help my reader base. A selloff is not going to take the 10-year to 6% in six months; that's a fantasy scenario similar to JGB scare stories. I am writing about a secular bear market. It would take at least a few years to reach such a level, in the form of short sell-offs punctuated by range trading. The Fed is not going to hike fast enough to ratify a faster-moving selloff. Sure, there are market losses for institutional investors. However, their actuarial liabilities are generally longer duration than their assets, and so they will actually improve their funding status. Pension funds are getting killed on the liability side over the past couple of decades, even with the bond bull market. Since no one is celebrating the bond bull market, why is the bear market going to be different? Worrying about the solvency of the Fed has to be the least of my worries. The Fed is going to run out of money (which it has the power to costlessly create)? "A selloff is not going to take the 10-year to 6% in six months; that's a fantasy scenario similar to JGB scare stories." If you know that *everyone* is going to buy at 5%, you want to get in ahead of them (at 4%, say). And *everyone* knows that. The JGB market shows how that logic works in practice. Do you have any view on the turn around in the oil price and what it means for the medium term outlook for inflation and interest rates? BTW, your blog is always a high quality read. I have been too busy on other things to have a useful opinion on oil. If global growth remains reasonable, I would expect oil prices to remain perky (at least until fracking becomes economically viable again). The effect on inflation is straightforward. There is a large direct impact on headline CPI, (although what matters are gasoline prices, not crude), to the extent that inflation-linked markets in the short-term are a proxy play on oil. However, once the short-term effects on headline wash out, there is very little impact on core inflation. Core inflation is driven heavily by wage trends, and things like foreign import prices and rents. The days of unions getting wage increases because headline inflation went up are long gone. The current state of things is politically unsustanable. I would say we cannot carry on this way much longer. The great divergence in wealth distribution cannot live long together with democracy. I too lack of imagination to say what is going to happen but certainly something is cooking up. Major international crises or great political shift (read socialism of some type) might very well totally change the picture. I am a prairie populist, and I do not fit into the traditional left/right spectra of other countries. So I am used to being a detached political observer. I would agree that the consensus view governing elites in the developed countries is out of touch wih reality, and hence creates opportunities for political turnover. However, the only thing they are good at it is hanging on to power. Therefore, even though change is inevitable, timelines are very uncertain. The Trump campaign highlights the situation. Even if he loses, he will do a lot better than his track record woukd have suggested was possible. Although you can say a candidate like him is inevitable, forecasting which election he shows up in is hard to do. Your Ten Year Yield graph carries a message but what is that message? Here is a basic fact that can help us focus: A government that wants to spend more than it receives in taxes must either borrow from itself or from the private sector. Now if government borrows from itself, it can borrow for interest payment as easily as for money it intends to trade for goods and services. The interest rate simply does not matter in this case. On the other hand, if government borrows from the private sector, government is asking the private sector to not spend. Instead, government wants to spend money the private sector has already earned. Interest payments act to encourage delayed spending by the private sector. With this background, we can begin to grasp the message contained in your chart. Over a 36 year period, government has paid less and less for the privilege of borrowing from the private sector. The current interest rate is near zero which which provides the private sector little incentive to delay spending. We nearly have enough background to begin to focusing on the fundamental question you raise: Will interest rates go up in the future? We observe this important current macroeconomic condition: Government continues to desire to spend more than it receives in taxes. As a result, government must continue to either borrow from itself or the private sector. This condition alone would drive up interest rates if the money supply base was fixed. The record (your chart) shows that over 36 years, interest rates have gone DOWN, not up. For me, this is conclusive evidence that government has been borrowing from itself (for 36 years), intentionally driving down interest rates by increasing the money supply. Government has now successfully driven interest rates to near zero. If government policy over 36 years has driven down interest rates to zero, why and what would cause government to now raise interest rates? Hmmmm. A paradigm change may be required.